Welcome back to Week 2 of the $100 Room Challenge as I take on the task of transforming our former office/craft/junk room into a nursery for our baby boy!! If you missed Week 1 and would like to see where we started, click here. I love it, do you?!?! I still need to find some knobs for the top two skinny drawers, but I’m loving how sophisticated it looks now. The paint color I chose is from Magnolia Home Chalk Paint in the color Blackboard. Blackboard is a black color that has hints of blue undertones. I have to be honest, it looks a lot more blue in the photos than it does in real life. Either way, I absolutely love the color! The best part? 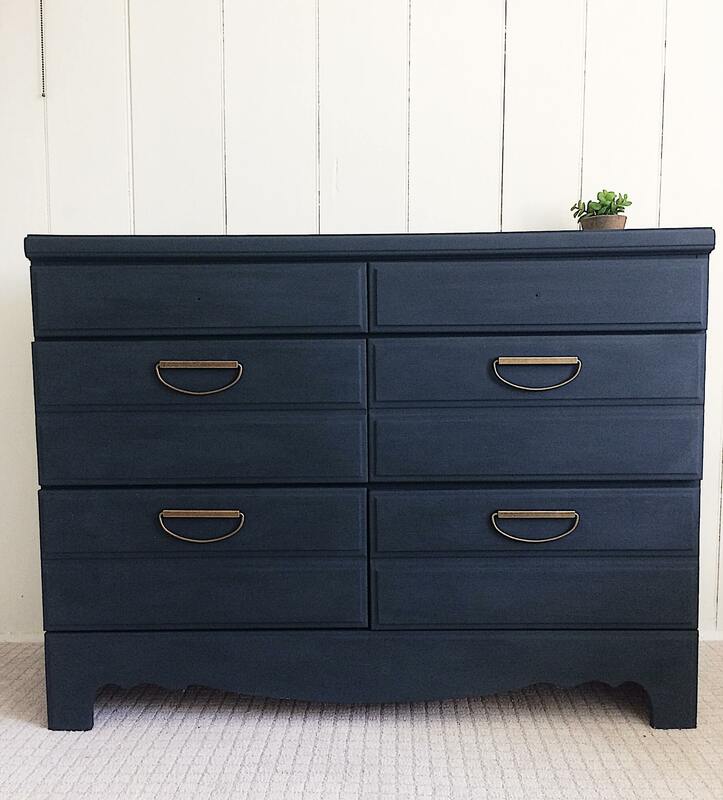 I had this paint left over from my piano makeover, so it was absolutely free, which is a big deal when you only have $100 to spend! The paint texture is so thick that I only did one coat with minor touch-ups afterwards. 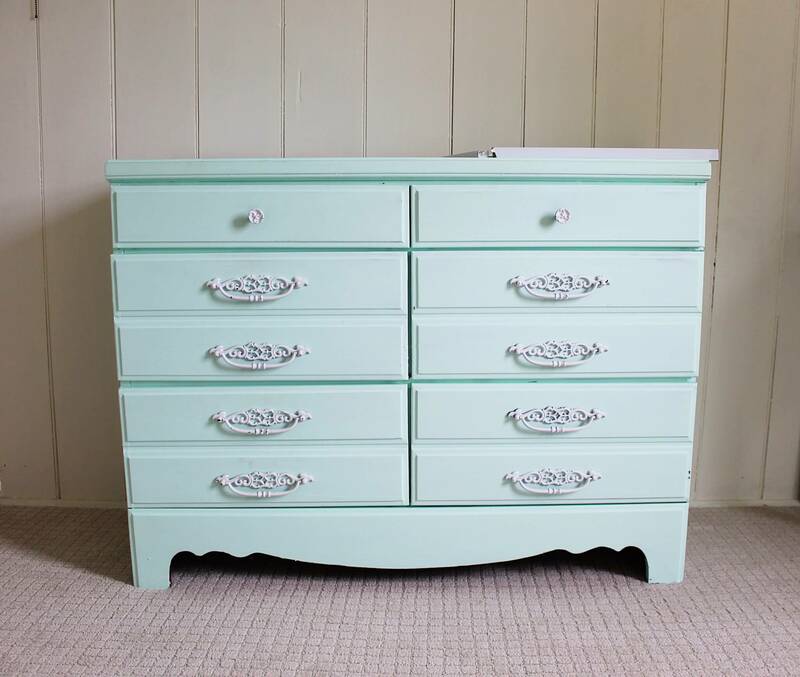 Not to mention the fact that one quart painted an entire piano, a nightstand, and this dresser!!! I can’t recommend it highly enough, and you can bet I’ll be looking for excuses to try some of their other colors! As for the gorgeous brass hardware, it is from the Hearth and Hand Line available at Target and I’ve linked it here for you! And a special shout-out to my dad for installing the new hardware for me! 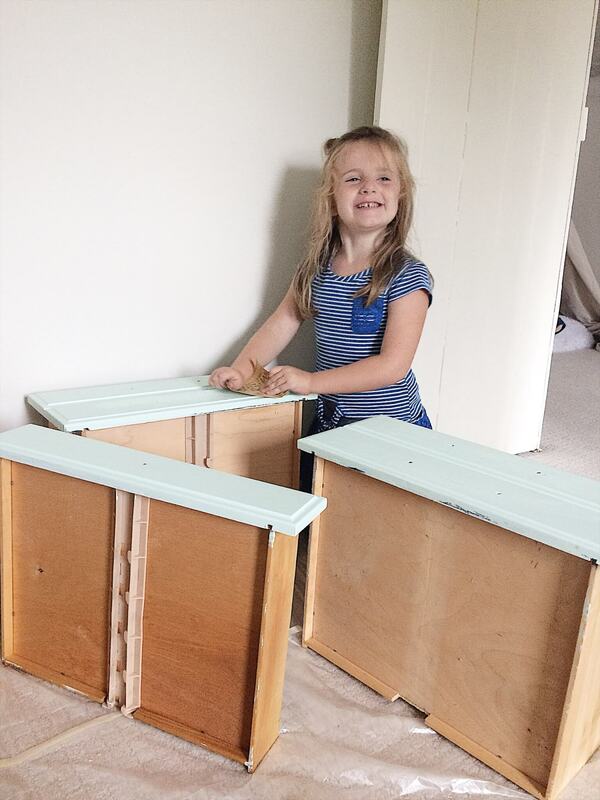 Of course, my little sanding helper was very excited to work on the dresser for me! My other project for this week was starting to make a cover for the brown cushion I’ll be using as a footrest. 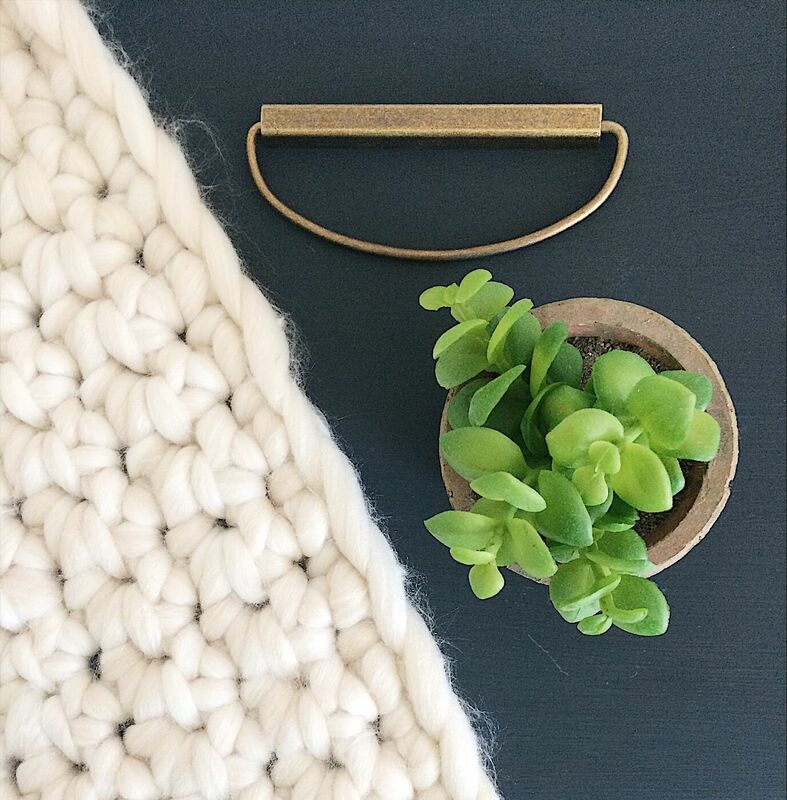 I found an amazingly soft, super-chunky yarn at Hobby Lobby and I think it’s absolutely perfect for the space! I’ve never crocheted a cushion cover before, and I’m totally winging it, so here’s hoping it turns out! Hopefully that gives you an idea of what it will look like, if I can just get it finished!! So where do I stand on my budget? The hardware was $16 and the yarn was $12 on sale. I’ll need one more skein of yarn to finish the cover, so I’ve spent $40 so far!! I’m feeling pretty confident about sticking with my budget, but we’ll see where I’m at in another week! Be sure to follow me on Instagram for all the behind the scenes fun!! I love that color combo Megan! And the brass is timeless. Love seeing the progress! Love it! No matter how many times I see a furniture transformation, I’m always surprised at how big of a difference a little paint and some new hardware makes. Looks you have a great start on the room. This looks gorgeous! I adore brass and love what you did with the dresser. Love that color!! Great progress! Omg! I love the brass hardware with the dark dresser! Well done! I had a little chuckle when I saw your chair. 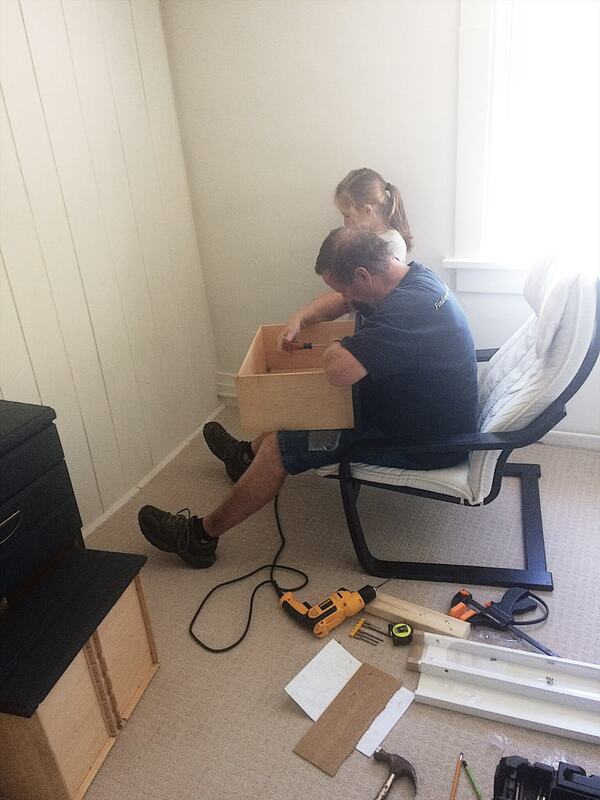 I have that same IKEA chair sitting in my room, and was thinking about recovering it as part of this challenge, but it will have to wait until the next one. Great job on the dresser. Stunning job on the dresser!! We have the same chair in my daughter’s nursery, and I love it. 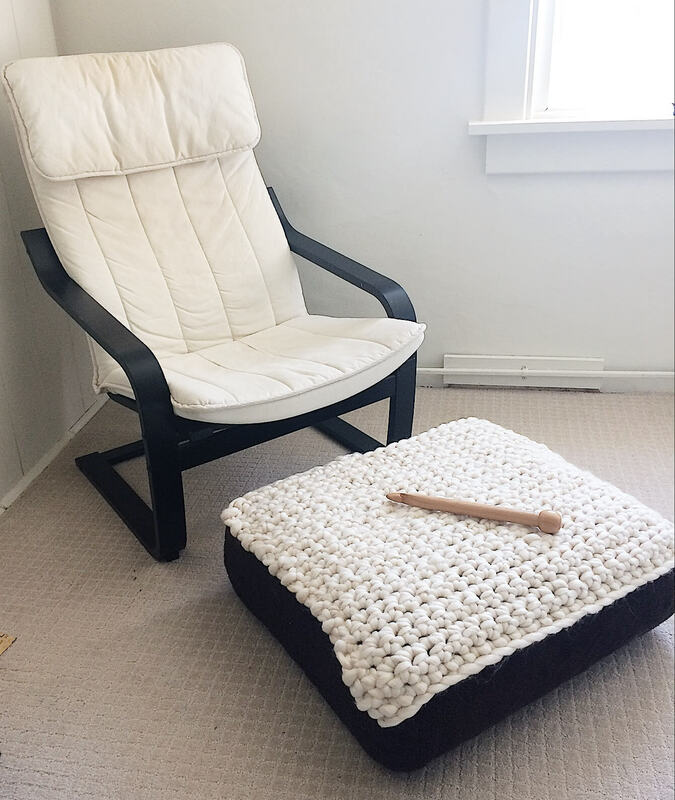 I love everything that you have done so far and the cushion you made is such a smart idea!